Plastic comprises more than two-thirds of marine litter accumulating in many coastal areas in Hong Kong, a new survey has found. Led by WWF-Hong Kong and six partners, the Coastal Watch Project found that the plastic in floating and underwater marine litter posed a grave threat to ecosystems. 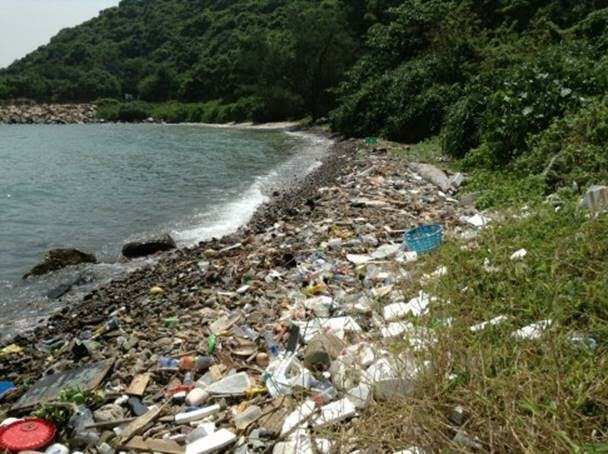 Project manager Patrick Yeung Chung-wing stressed that the marine litter problem had to be tackled at source as it would be absorbed into the food chain and affect human health. “We also found fish bite marks on pieces of plastic litter,” he said. An average of 391 pieces of marine litter sized more than 1cm were collected in each five-metre stretch. In total, plastic accounted for 62 per cent of the litter. It mainly consisted of fragments, packaging, bottle caps, string, rope or ribbon and cutlery. A total of 131 pieces of smaller marine litter were collected in every one-square-metre area, with plastic constituting 67.4 per cent of the rubbish. Items were mainly polystyrene fragments, broken pieces of polystyrene boxes and other forms of packaging. The researchers’ first ever investigation of the underwater situation also showed that 60 per cent of the refuse in every 100-metre area consisted of plastic debris such as disposable items and abandoned fishing gear. Heavier items such as glass and metal were also common. Roughly 85 per cent of floating marine refuse was plastic such as packaging, bottles, cutlery, foam boxes and even large containers from the city’s markets. About 1,125 volunteers collected data at 27 coastal sites ranging from mangroves and mudflats to beaches and rocky shore habitats between last July and this May. 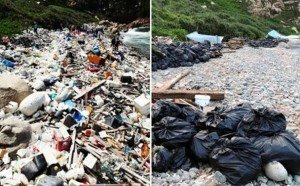 The government’s Inter-departmental Working Group on Clean Shorelines, which is coordinated by the Environment Bureau, says it will continue its “three-pronged strategy” of reducing overall waste generation at source, reducing the amount of refuse entering the marine environment and removing marine refuse as well as discouraging use of disposable items and encouraging recycling.